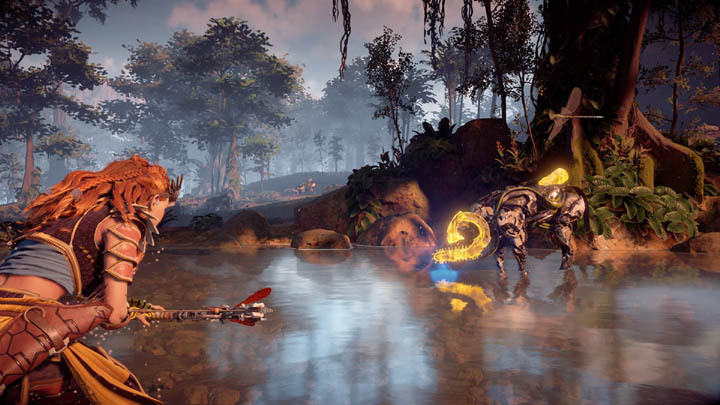 Modifications in Horizon Zero Dawn provide players with a means to upgrade weapons and armour by applying bonus traits to their base stats. 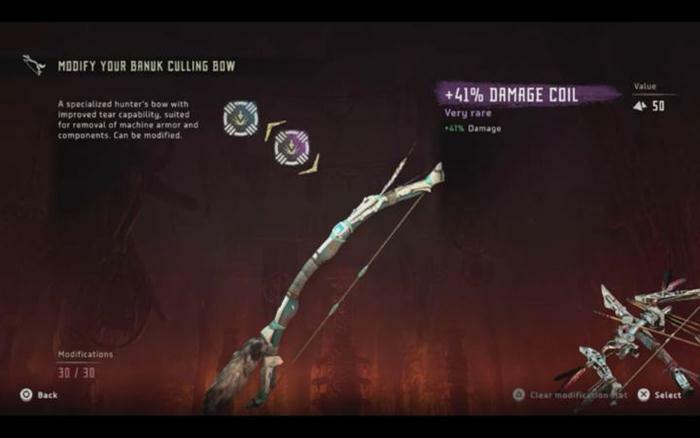 As you probably know, Horizon Zero Dawn's best items are classified into the Very Rare category, signified by a deep purple colour. In this guide I'll show you an easy way to farm for purple Modifications from the beginning of the game, setting you up for the game's tougher machine fights. Each of the games elemental effects (fire, freezing etc.) in addition to the other mechanics (shock, stealth) are wrapped into the bonus effects of Modifiers. Each modifier will increase your base stats for the particular element that it corresponds to. For example, a Fire mod will increase your resistance to fire (in the case of armour) or your Fire damage (in the case of weapons). Note: It's worth pointing out that farming mods will make you overpowered quite quickly. 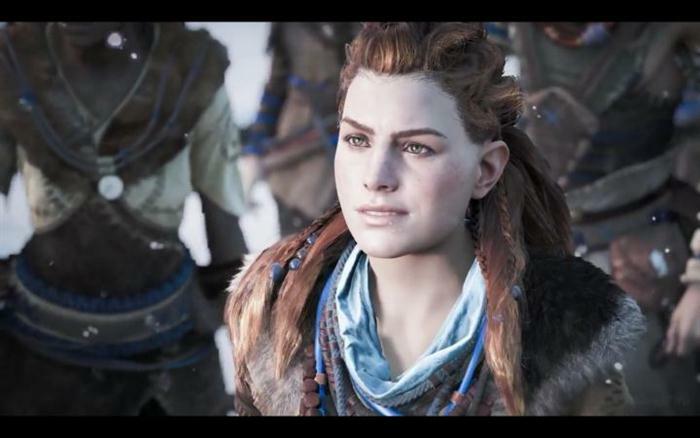 If you prefer to enjoy the challenge of Horizon Zero Dawn then it might be worth avoiding this method, or possibly saving it for when you get really stuck. This particular farming location is near the beginning of the game in the starting area of the world map. To be more precise this is the south eastern side of the world map, before you reach the Proving quest. See the image above for a visual marker. From the south eastern corner of the world map, pan to the western edge of the map (i.e. before it goes black). Take note of the Scrapper machine site, all by itself. This is a lovely level 8 Scrapper site so easily accessible from the early part of the game. Also take note of the Camp Fire site to the east of this Scrapper site - we'll use that later too. Within the Scrapper site vicinity are two loot crates/spots where high level rewards can be collected. This is your farm spot. On my first attempt I found two purple loot crates containing 2 x mods in each. A very handsome reward for very little effort. These two loot crates are always in the same location, near to the Scrapper site. Of course you will need to fight off the machines first to clear the area but this provides additional machine parts as an extra reward. Rather than wasting arrows on the Scrappers, I strongly recommend using your spears heavy attack and maybe the Critical Hit skill to makes things even faster once a machine goes down. The stats for the mods you find will scale based on your current level. When below level 10, expect to find 5-10% stat increases whereas when you're over level 20 expect to find mods with stats of 30-40%. The nice thing about farming is that it doesn't matter too much because you can repeat enough times until you really do get what you want. 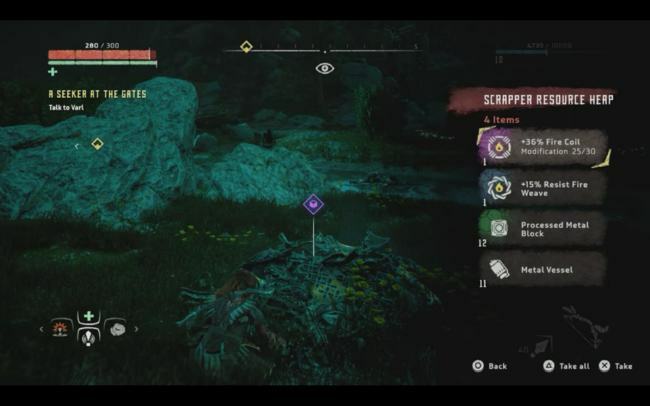 Players should note that on subsequent visits I did encounter a mix of green and blue Mods so purple isn't always guaranteed but it's still a high probability compared to other places in HZD. If you do encounter lesser rewards then it certainly isn't a wasted trip since these can be sold to a merchant for a healthy number of shards. As with any good farming guide you expect some degree of repeatability and that's exactly what we have here. Once you've collected the valuable loot, head back to the Camp Fire to the easter of the Scrapper site and save the game. Now reload (or attempt without reload), and revisit the Scrapper site to see that the two loot crates have been replenished for your next visit!! Now simply rinse and repeat until you're content.